The 2016 Camaro features a taut, lightweight chassis, less-thirsty powertrains, and plenty of technology and creature comforts. DETROIT -- The race for the title of top-selling U.S. sports car is about to kick into overdrive. Not for 2015. Ford has it wrapped up, with the sixth-generation Mustang breezing past the aging Chevy Camaro for the first time in six years. But now the generational timing of the iconic muscle cars is aligning like the stars as the first copies of the sixth-generation Camaro roll into dealerships next month, just 13 months after the first new Mustang in a decade. Like Ford, Chevy has brought its '60s throwback into the modern era, with a taut, lightweight chassis, less-thirsty powertrains and plenty of technology and creature comforts. Both brands are trying to reach beyond their traditional fanboy customer bases to grow market share in a segment that's surprisingly prone to cross-shopping. "Appealing to our enthusiasts is big, but more importantly, we need to appeal to that mass audience of people who are just entering the sports car market," says Camaro marketing manager Todd Christensen. "There are a lot of casual buyers looking for the latest and greatest cool thing." Attracting them could help expand the Camaro's role from a niche halo car to a higher-volume contributor to Chevy's car lineup, which could use the help amid weaker sedan sales. Ford is already reaping the benefits of a more sophisticated Mustang, sales of which shot up 61 percent through September. "We're finding our biggest source of conquests is from outside of the sports car market," says Erich Merkle, Ford's chief U.S. sales analyst. 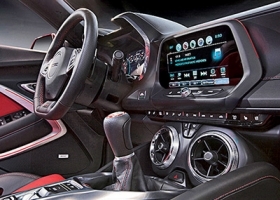 "People are quick to move, not just among Camaro and Mustang and Challenger, but in and out of the segment," IHS analyst Tom Libby says. That could help explain why both automakers are trying to offer something for everyone under the hood. For the first time in more than three decades, both the Mustang and Camaro will be available with a four-cylinder engine, in addition their V-6s -- traditionally the volume powerplant -- and the V-8s favored by the diehards. But there are key differences in the powertrain approach, too. The Camaro begins arriving in stores next week. Ford's strategy steers buyers to its 2.3-liter, four-cylinder EcoBoost. Even though V-8s typically dominate the first year of sales on a new-generation muscle car -- and even though the four-banger costs an extra $1,500 over the base V-6 -- the 310-hp EcoBoost has taken off, accounting for 36 percent of sales through September this year. The V-8 GT model still garnered a respectable 43 percent of sales. The V-6, long the Mustang's volume engine, accounting for 60 percent of sales on the last generation, has been relegated to base-model buyers and rental-car fleets. It's tough to find one with leather seats. The EcoBoost model has been the key to success in California: Nearly half of Mustang buyers there have chosen it, and 56 percent of them are new to Ford. It has also helped draw overseas buyers of the Mustang, which is sold in more than 100 countries. 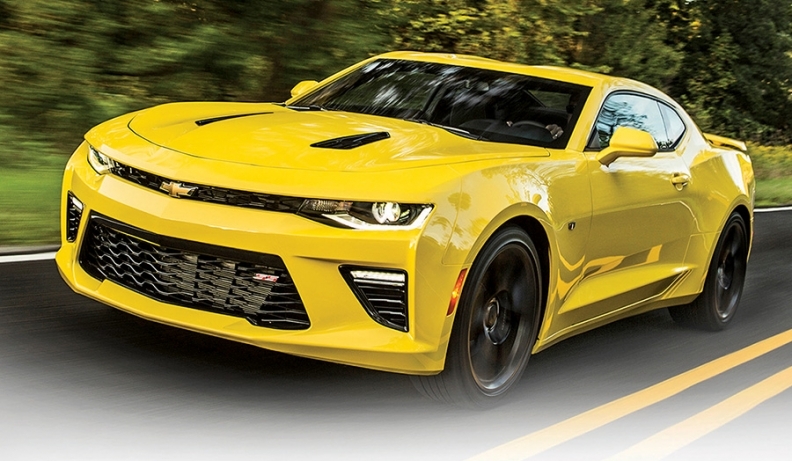 Meanwhile, Chevy is looking to fill the V-6 void. 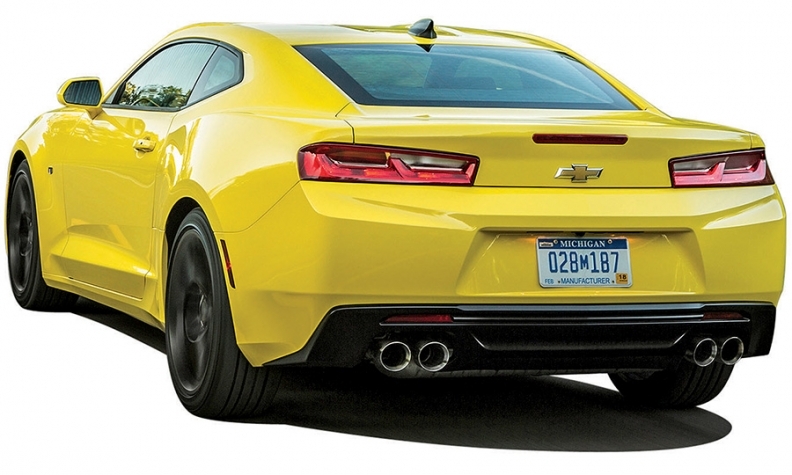 The Camaro's 2.0-liter four-cylinder turbo is the base engine, with a $1,500 step up to the 335-hp V-6. Both of those, along with the V-8 on the SS model, are offered on all trim levels. "We're not looking to force anyone into one powertrain," Christensen says. "We now have the ability to deliver on almost anyone's needs."